When you get into the routine of cooking at home, you’ll eventually find yourself falling back on certain staples. Some of them are things that go into almost everything you cook, like a dash of salt or some black pepper. Others are simply key ingredients in a lot of the recipes that you actually make. These things vary a lot from person to person, but for us they tend to include pasta, dried beans, dried rice, tomato sauce, dried oregano, flour, and flash frozen vegetables of a lot of different varieties. There are also other things that have multiple uses in the home beyond just cooking, like baking soda and vinegar, and there are household supplies such as toilet paper. All of the things mentioned here are things that we buy in bulk. Anything that doesn’t have a quick expiration date, can be easily stored, and is something that we use on a regular basis is a target for bulk buying. Not only are items bought in bulk less expensive per pound, but they also shorten your grocery list and can help you squeeze out a few more meals at home before you have to return to the store. That saves on the travel cost and time of shopping, as well. I’ll use a real example from our own pantry. We use extra long grain rice in a lot of the dishes we prepare, as my wife and I love curry and stir fry. Dried rice can easily be stored in the home, so when we get a chance we stock up on rice in abundance. At our local grocery store, we can buy very similar rice in a two pound container for $3.99 or a ten pound container for $10.99. Obviously, the ten pound container is cheaper, as you’re getting near a dollar a pound. Sometimes, we’ll see sales that drop the price even lower, but those are irregular and hard to plan around. For comparison’s sake, at our local warehouse club, we can buy a fifty pound bag of long grain rice for $17.67. That’s about 38 cents a pound. Now, assuming we can get through even half of that rice over a reasonable period of time, we’ll save money buying in bulk. If we can get through that entire bag, we’re saving a lot of money. The same phenomenon holds true for almost every item I mentioned at the start of this post. A large bag of frozen vegetables is less expensive per pound than a small one. 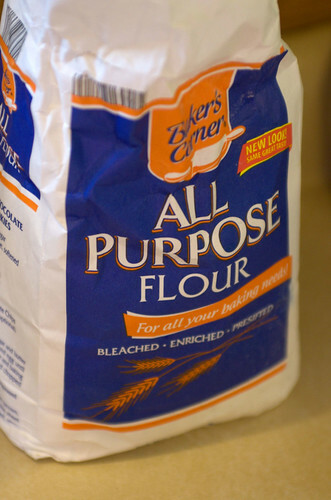 A large sack of flour is far cheaper per pound than a small one. A case of tomato sauce is less expensive per jar than a single jar. We even buy baking soda in bulk. You can buy a 13.5 pound bag of baking soda for $6.68 in our local warehouse club. Put some in a plastic cup in the back of your refrigerator and use it as needed and you’ll do fine. Compare that to a typical price for an eight ounce box in the store, which is usually in the ballpark of $0.89. Buying that much baking soda per box would add up to about $25. The key to saving money this way is sticking to stuff that you’re sure you’ll use before it expires. If you don’t know that you’ll use up that much rice or if you don’t think you’ll use the baking soda before the expiration date, don’t buy it. Focus on things you use all the time so that you’re sure you’ll use it. You’ll also want to be sure you have adequate storage space for the stuff. We store a lot of the non-food items in our garage when we’re not using them, plus we have a pretty large pantry. At our previous residence, we didn’t have much storage space at all, so we couldn’t really take advantage of bulk buying. If you can’t store it, it’s going to be wasted. If you can handle those caveats with ease, buying key items in bulk can really cut back on your food and household budget. It’s one of those things that, once you’re in the routine of it, you can’t believe you ever got by without it.